Shocking. I don’t even understand what the conflict there is all about. I do…and it’s complicated. It’s much better than it used to be, but it’s not over yet. This is one of the most horrible tragedies that I have ever heard of. The protest was about the fact that a year earlier, the British government started detaining people suspected of involvement in the IRA without a trial. 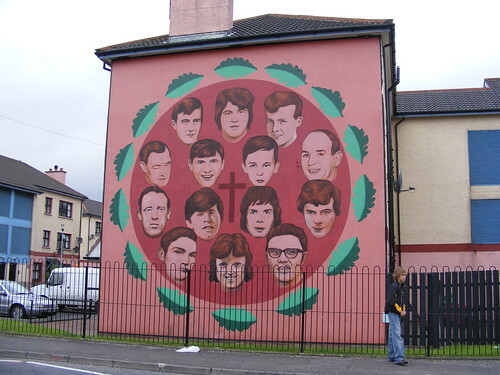 That is what these brave souls were protesting, unarmed, on this Bloody Sunday. My heart goes out to those who lost and suffered on this day. Helen, simply put, North Ireland is only British because Britain decided to keep it when they returned the rest of Ireland. To this day, almost every single Irish man, woman and child, wishes to have all their country reunited. Simply put, Britain gave back Canada, Jamaica, and numerous other countries, gave it back to those who lived there. The whole time we’ve been askin whens it our turn. Now we’ve finally decided that we are not going to wait. Now we’ve decided we want our turn now, and we arent going to wait any longer.